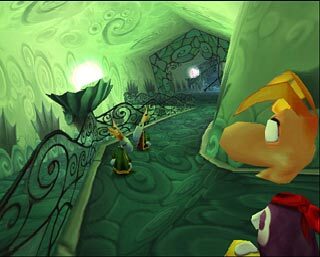 The_IT_08 has wrote a topic in our forum with some beta-screens and a video from Rayman 2 that shows a series of differences. As he says: “Alright in the first picture there is a level called The Minhir Hills, it is a beta version of it, and this takes place in the second section of this level I think (because the walking shell’s starting point which is now the doghouse is close to the thorn pit). The differences are that there wasn’t a giant orange mushroom in there and the place where the walking shell comes from was not a doghouse. And there was a purple lum and it looked kind of different from the final version. The second screenshot it takes place in the Iron Mountains, the diference there was that Ly the fairy wasn’t shown in that level in the final version. The third screenshot takes place in a level called the Woods of Light. The difference is that there was no flower platform in the final version of the level, there was only one globox kid waiting for you, and Rayman looks diferent. The fourth screenshot takes place in a level called the Whale Bay, where the pirate seal is not red in the final version. In the beta video there are loads of beta stuff. The levels were different and the enemies were from the final version but the dark catapillar was pink instead of black in the beta. Rayman didn’t throw rays of energy but instead fists like in Rayman 1 and 3. Thanks a lot to The_IT_08 and Cody Collins for the contributions! where can you download the beta? I dont know if someone have already extractec the bonus / beta level from the PSX game, but it should be possible somehow.. Please, is there anysite in the web for download the beta? Where did you get these images?? Isn’t there an even earlier Beta for Rayman 2 that looks like the first one? Or would that be in the PSX section? Rayman 2 was originally made for the DreamCast, so the Beta won’t be much different, as the final copies from the 64 and DC are almost identical, and those 3D scenes were just made for the commercial. I’d like to note that also in that video of the Rayman 2 beta, Rayman didn’t throw rays of energy but instead fists like in Rayman 1 and 3.
bodies look so determined? At very first you may think it’s because they naturally look this way or possibly because of exactly how the phase lights struck them but believe it or not, body builders utilize sunless tanning or tanning lotions in order to attain that “hard as granite” look, to display sharply-defined shoulders, arms and abs that the judges and audience admire so a lot.